Every year, the horrendous monster 年 (Nián) would terrorize villages. It would eat everything, from mosquitos to human beings. As time went on, the villagers realized that the monster came every 365 days to wreak havoc before disappearing back into the forests. So the villagers decided that on that day, they would prepare a feast and dine before the ancestors for protection. After years of hiding like this, a youth came up with the idea to use firecrackers and scare the monster away once and for all. Such goes the legend of the origin of Chinese New Year, also known as the Spring Festival. Because the purpose was to scare off Nian and prevent it from returning, the holiday decorations are typically a bright and loud red. The color red is much loved by the Chinese in general as it represents happiness and good fortune. Below are some popular decorations used to create festivity for the celebration. Paper cutting is a folk craft that can be seen in every season, but are especially prominent during the Spring Festival. Usually seen on windows, the literal translation its name is “window flower.” The craftsmen will painstakingly create these beautiful works and paste them on using sticky rice glue. Paper cuttings of the Chinese zodiacs. 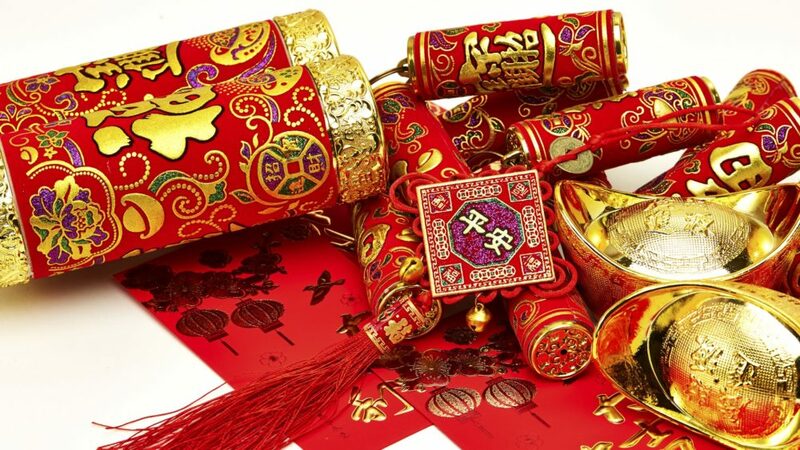 These decorations are usually of auspicious symbols and words and made of red paper. Images include fish, peaches, grains, dragons, phoenixes and more. Some, such as fish, are puns for blessings. Others, like dragons and peaches, are symbols from folktales and legends. Grains and related images, on the other hand, represent hopes for a good harvest. More on that later. Chinese folk religion includes various types of gods, as well as revered historical figures (either real or legendary.) One type is Door Gods. As the name implies, paintings of these gods are pasted onto the main door of a home. The main entrance traditionally consists of two doors, so the gods always appear in pairs. The most famous demon hunter Zhong Kui (钟馗 – Zhōng kuí) has a terrifying face. This is why door gods all have angry eyes, twisted features and hold traditional weapons. They are ready to protect the family against any demon or spirit. In another story, the Emperor Taizong of the Tang Dynasty (唐太宗 – Táng tài zōng) heard the cries of demons at night. He ordered two generals to guard him outside the door. The cries were never to be heard again and the Emperor decided to paste portraits of the generals on the door. Although these decorations are not as popular in modern times, some regions of China still do this to bring peace and fortune into the household. Similarly, Chinese people decorate by hanging up certain words. The most common word is fu, happiness and good fortune. It is written with calligraphy onto a square piece of red paper. These can then be pasted onto walls, doors or windows. Fu is often incorporated into other decorations, such as paper cuttings and paintings. As a play on words, many like to put fu upside down. The word for “upside down” (倒 – Dào) is a homophone of “here” (到). This pun represents that good fortune is coming, or is already here. Spring festival couplets, door gods and fu. Nowadays, you can see them alongside the doors of nearly every household during New Year’s season. An optional shorter third line is placed above the doorframe. Much thought is put into these poems. The number of words of each line should be the same; if you’re writing your own use a word counterto make sure each line contains the same number of words. The literal translation of this specific type of painting is “[new] year drawing.” They are also known as “New Year prints.” This is a craft with a history of at least one thousand years. In line with all New Year decorations, these paintings are used by the people to express their wishes for the future year. The traditional Chinese art style is used, but with the invention of printing technology, the style and image depicted diversified. Some call these paintings the encyclopedia of folk life. Concepts can go from heavenly creatures to folktales to everyday activities. A large majority of prints depict either a chubby doll-like child or a beautiful woman. These images express wishes of healthy children and a loving a family. There are three distinctive major schools of nian hua: Táohuā wù (桃花坞)from Sūzhōu (苏州), Yángliǔqīng (杨柳青) from Tiānjīn (天津) and Wéifāng (潍坊) from Shāndōng (山东). The English name of this golden fruit comes from its Cantonese pronunciation gam kwat, which translates literally to “golden tangerine.” As you may guess, this fruit is popular in Southern China, especially Hong Kong and other Cantonese-speaking regions. Guangdong is known to be the home of kumquats. The character 桔 (jú – tangerine) looks similar to 吉 (jí), which means “luck,” while the golden color is festive and represents wealth and fortune. Add to that the fruit’s delicious flavor on its own and in various desserts, and it’s really no wonder why so many will buy a small tree to plant in their homes during Chinese New Year! The Spring Festival celebration spans a total of 15 days, with different activities for each day, culminating in the Lantern Festival (元宵 – yuán xiāo). There are many styles of lanterns, from basic shapes like spheres, to lotuses and even dragons! Some people write the word fu (福 – Fú), poetry or other calligraphy on the lanterns before releasing them. People setting off Kongming lanterns during the Chinese New Year festival. The Kongming Lantern (孔明灯 – Kǒngmíng dēng), named after Confucius, is especially important during the Lantern Festival. People write down wishes on each side of the lantern and let it fly to the heavens, hoping their wishes will come true in the new year. Very popular around this time, these flowers are popular in decorations. The plant is considered sacred in China. The flowers are customarily placed in beautiful and valuable vases. The peach fruit represents longevity and that makes the fruit and its flowers very important to the Chinese, especially around this time. 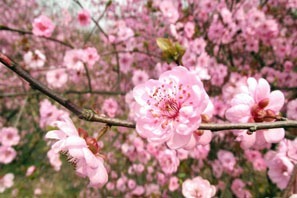 In addition, peach blossom symbolizes romance, prosperity, and growth. These are popular with single young people, looking for love. As touched upon throughout this article, there are various symbols that can be seen from Spring Festival decorations. All have auspicious meanings, but can be divided into two general groups: play on words and objects from legends. Due to the nature of the Chinese language, there are countless homophones. It’s a goldmine for those who like to think of clever puns. Take, for example, the fish mentioned in the paper cutting section. New Year paintings will sometimes be of a child holding a large fish as well. Why? The word 鱼 (yú) has the same pronunciation as 余, which means “extra.” The common phrase is 年年有余 (Nián nián yǒu yú), meaning to have “yu” every year. Here, the character for “extra” is interchangeable with “fish.” So if you have fish every year, you’ll also have extra money, harvests and luck! As for things of myths, dragons and various gods can always be expected. Zodiac animals, especially the animal of the year, go without saying as well. Chinese culture has a history that spans thousands of years. The Spring Festival, being the most important holiday, is infused with cultural essence. Ancient traditions are passed down and still influential today. By taking a closer look at Chinese New Year decorations, you can glimpse at the stories behind each carefully thought out detail.